When Shalu got her period, no one including her mother spoke to her about it. She didn't know how to manage her bleeding.Through a friend, she learned that she had to use a cloth to absorb the blood. Not knowing how to get a cloth, she ended up using pillow covers and bed sheets. This angered her mother and she got beaten up for wasting money. She came to know of sanitary pads through a classmate. When she asked her for a few, she was snubbed saying they were expensive and could not be given away for free. Shalu started falling sick with the fear of getting her period. With no access to sanitary products, she resorted to praying to God to stop her periods forever. Her period, which is a normal bodily function, became an unbearable trauma for Shalu. It was during this time that Goonj came in with the 'Not Just A Piece of Cloth' initiative to her school. She got her 'My Pad' kit which came with 10 reusable pads, one undergarment and a menstrual hygiene awareness brochure. This kit changed her life and gave her the freedom to live like a normal adolescent child. She doesn't dread her period anymore and knows how to manage it. Women in India's rural areas are struggling for the basic needs of life. A sanitary napkin is the last thing on the minds of most. This simple piece of cloth saves many women from incidents of helplessness and indignity, which is why it is called 'Not just a piece of Cloth'. It is a solution which is practical, easy to use, and is environment-friendly. Your monthly donation will help more girls and women like Shalu get access to My Pad kits. You can give with confidence because every program on our platform is GIVEASSURED. Give now and help women grow out of the culture of shame. Poor women, especially in rural areas, struggle to get a clean piece of cloth to manage their period every month. There is a lack of awareness about menstrual health and hygiene. Living in a culture of shame and silence, they end up using poor substitutes like rags and ash, or worse they use NOTHING. This aggravates their day to day misery around this basic need. Goonj through its 'Not Just a Piece of Cloth' initiative has distributed more than 4 million cloth pads across India and organized thousands of awareness meetings among the most backward communities all across the country. Goonj makes the urban masses aware of this basic need and motivates urban communities to contribute their cotton cloth. This cloth is sorted at their processing centers. The un-wearable cloth is sorted out from the cotton and semi cotton cloth for making MY Pads. These are washed, sun-dried, cut, ironed, wrapped, and made into a pack. These packs also contain a leaflet with instructions, an undergarment, and a pouch for keeping used cloth pads. When you donate to this program, you help women and girls in underprivileged communities get access to reusable cloth pads to manage their periods. Goonj is an award-winning social enterprise working to build a bridge between the cities and villages. They focus on empowering the communities in far-flung villages to solve their own problems. For the last 19 years they have established a culture of mindful giving in urban India. They collect vast stocks of everyday necessities; from clothes to medicines, that would otherwise have been thrown away. Every year Goonj processes thousands of tons of urban surplus material to run 3000+ development activities across rural India. With the clothes as motivation, people build bridges, dig wells, repair roads and other community building activities. These people don't get material as charity but earn it as a reward for their work. The work that Goonj does brings attention to essential but often ignored needs of people. Millions of kilograms of donated cloth is turned into sanitary pads, Sujnis, and Aasans, giving livelihood to thousands of people. Goonj is a mass movement connecting people in the cities and villages of India as equal stakeholders. Millions of women in India and in many other parts of the world still struggle for basic clothes to cover their body. For them this struggle becomes bigger as they also struggle for a basic piece of cloth for their menstruation every month in an environment of strong silence and shame around this issue. In such a scerio they end up using rags, ash, newspapers, jute bags, used pads, sand in dire compulsion or worse they using NOTHING. This all pervasive taboo around this basic need is present in the cities and villages of India which prevents women from even voicing their menstrual challenges. 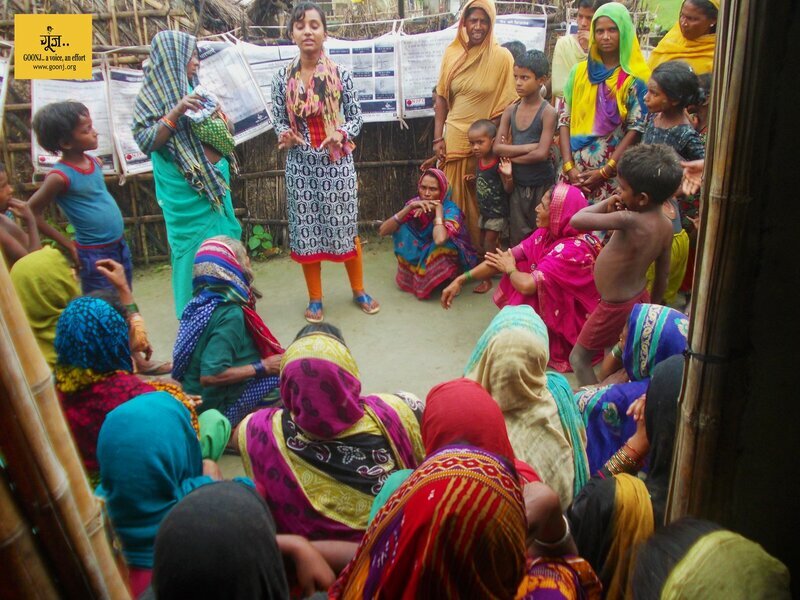 Goonj has been working on this issue for the past decade, focused on evolving a comprehensive solution around what we call the three A’s (Awareness, Access and Affordability), with a larger focus on creating a space for women to talk about their menstrual challenges and treat it as a normal. That is why our work around this issue is not just about providing pads or a product, but to trigger a mass scale dialogue in the society and make it a normal issue. The clean cloth ‘MY Pads’ we make from surplus cotton cloth from the cities act as a talking point with women in villages and slums about related health and hygiene issues and breaking the silence and shame around it by creating a safe space for women to share their challenges and restrictions and make it normal. In the last 3 years, we have reached out with over 19, 27,000 cloth My-pads and over 95,000 under garments to women creating awareness on menstrual hygiene and breaking the silence on the subject. Goonj’s Break the Silence Meetings ‘Chuppi Todo Baithak’ with women across rural India are insightful about their menstrual awareness and health issues. One such story is from Ambapada village of Banswara district in Rajasthan. Rough roads connecting to the nearest market are 10 kms away for any woman who wants to buy a sanitary cloth/pad. The land here is fertile but the farmers have to depend on rain for farming. Life overall is tough as many people survive as daily wages laborers struggling on a day to day basis. Like many other villages of India there is little awareness among men and women about menstrual health and hygiene, in a culture of shame and silence and taboos. When Goonj’s team reached this area and started a dialogue with the women of the area about this basic, there were hardly any women or adolescent girl who spoke up in our Break the Silence Meeting. On a specific question to the 14 year-old Kanchan about her menstrual practices, the conversation started as she spoke up. With some hesitation Kanchan shared how she had no idea what menstruation was when she first menstruated. She shared that she was very scared but her mother just gave her a piece of saree and never explained the reason for menstruation. Kanchan shared that she uses whatever cloth is available to her at home; blouse piece to trouser etc for this purpose. She also shared the many taboos and don’ts she faces during those five days like not being allowed to enter the kitchen or not allowed to touch anybody, forbidden from going to temple. Even going to school is not allowed during menstruation. All these restrictions make her very angry but her mother has only one response “This is how women are supposed to live their lives. When Goonj team started implementing menstrual hygiene related awareness in Kanchan’s village under our Not Just A Piece Of Cloth (NJPC) initiative, she and other adolescent girls and women of her village learnt about many critical things about menstruation like hygiene practices around using cloth pad and disposal of used sanitary cloth etc. The Break the silence meetings with the girls and women of the community provide a much needed space, where they can talk openly, discuss and unlearn the culture of shame and their menstrual challenges. 55 people are currently supporting this.